I have an addiction. I’m sure there are others who share this addiction with me, but I don’t know of anyone personally. Even as a young child I remember staring, overwhelmed with the samples on the counter that were waiting for me to try them. I am obsessed with perfumes. I’m embarrassed to tell you that when my daughter was little, we would go into the perfume section of any store and she would ask the lady behind the counter if she could have a sample for her collection. (Who could resist her sweet face?) She always got one or two from each store we went to and we put them in a pretty box in her room. Elaine just wanted to look at them, she thought they were cute little bottles. When she would fall asleep I would sneak back into her room to open and smell them all. I’d choose one to wear to bed. During the day I’d bring my favorites into my room and use them whenever I wanted. She had so many she never knew they were missing. I used my daughter as an accomplice and then and stole her perfume. When I started Alegna Soap® I had some issues with headaches. I was no longer was able to wear synthetic perfume. I was able to wear essential oils and I did. And that’s when I was introduced to natural perfumes. I took perfume making classes with Charna Ethier of Providence Perfume and with Julianne Zaleta of Herbal Alchemy. 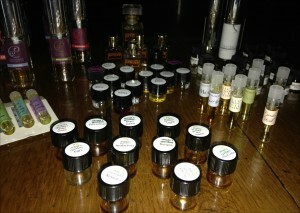 Even though I was making my own perfume, I started ordering samples from natural perfumers. I fell in love with so many of them I bought larger bottles. Sometimes I find myself opening them up and smelling them. I like to arrange them in different orders, sometimes by seasons, sometime by perfumer and sometimes by preference. I have 76 different perfumes now and I know I’ll purchase more. I think I have a problem…. Do you have an addiction to something? Does anyone else have one to perfume? Right there with ya, Angela! 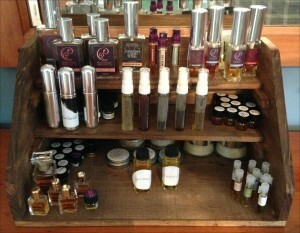 I LOVE natural perfumes! I see another class together in our future Lisa! I love little bottles. I don’t wear scents, but I love the containers! Those little bottles are so cute, aren’t they Diana. I think that’s why my daughter liked them so much. I don’t wear perfumes often; hubby says they, “smell great, taste like ____.” My addiction is to lip sticks and lip glosses. I make my own lip balms and glosses (sheer only), but I love color. The struggle for me comes when I have to use a small evening bag and only have room for one or two tubes. I’m not a lipstick girl at all Sara. Whenever I put it on it usually isn’t on right and after an hour it’s off because I bite my lips.